Celebrations have been taking place across Israel to mark the 60th anniversary of the founding of the state. Israeli families enjoyed fireworks, concerts and an aerial display while countries around the world, principally those countries that helped create Israel, showered it with words of admiration and congratulations. Earlier this week, British Prime Minister Gordon Brown congratulated Israel on its 60th anniversary of independence, calling the state's creation one of the "greatest achievements" of the 20th Century. George W. Bush, along with present and past European dignitaries, is expected to attend the festivities. Not far from the celebratory atmosphere, more than twenty thousand Palestinians, most of whom are Israeli citizens, marched on the site of the deserted, former Palestinian village of Safouria near Nazareth to reiterate their "right of return." They carried banners that read, "Your Independence is our Nakba" or catastrophe in English. Many of them wore the key of their abandoned homes around their necks. The demonstrators were confronted by Israeli police and several were arrested, beaten, or suffered from tear gas inhalation. Most likely, George W. Bush and other dignitaries will not be taken on a tour of the vacated village of Safouria or the more than 500 Palestinian villages that were depopulated and destroyed. They won't visit any of the many Palestinian refugee camps sprinkled all over the West Bank and Gaza. 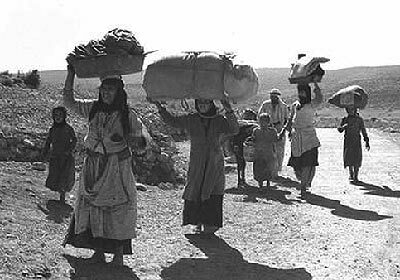 In 1948, an estimated 700,000 Palestinians were forced to flee their homes as a result of the creation of the state of Israel. These dignitaries will be driven on by-pass roads to circumvent the ugly wall that has destroyed the landscape, and carved up Palestinian farms and villages, locking Palestinians themselves behind it like caged animals...or they may pretend not to see it or simply make excuses and justifications like it has made "Israel safer." Yet sixty years later, military service remains a mainstay of the Jewish state, with a hefty budget of some $14 billion in 2008, comprising around 17% of the state's budget. Meanwhile, Israel's milestone comes at a time of increasing frustration with the Middle East peace process. Many Israelis are disappointed that successive peace negotiations have not led to wider regional stability. For Palestinians, it has been 60 years of pain, of hopes constantly dashed, 60 years of uncertainty, exile, misery and Nakba...Catastrophe.